Potato chips are at the top of my list as a favorite snack, and I’m probably not alone in the craving for that crunchy, salty and not very healthy choice. 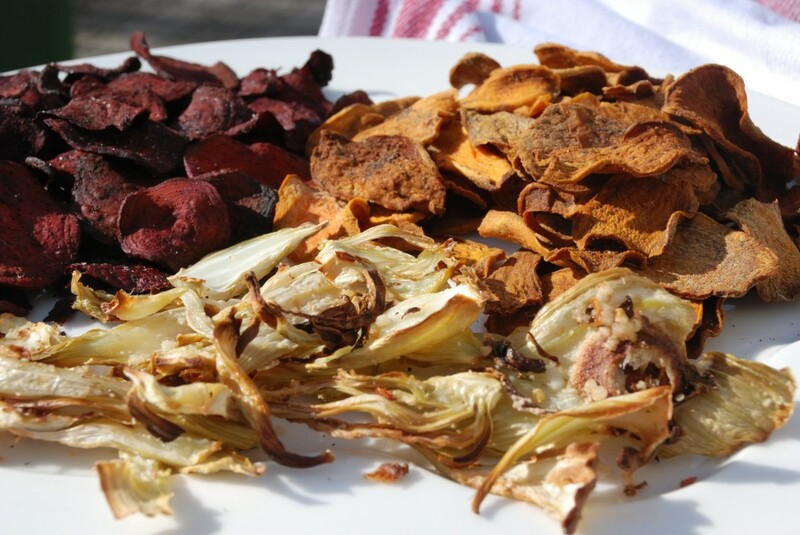 Vegetable crisps are available, but often fried or made with a good deal of potato starch and sometimes food colorings. Using a dehydrator or a microwave are options for drying sliced vegetables, but my choice is making use of my ovens. Experimenting with all sorts of veggies has been an adventure and having two ovens has allowed me to work in larger quantities. Although I have supplied recipes, the baking times may vary depending upon variables such as type of oven…gas or electric…convection or non-convection, as well as the accuracy of each person’s oven. I begin watching the chips closely once they have been baking for about forty minutes…even less time if they are sliced very thin. Try and do so without constantly opening the oven, which drops the temperature from an already low 250 degrees F. Also make sure to remove those outliers…those sliced thinner than the rest on the cooking sheet…before they burn. The vegetable chips will continue to crisp as they cool. They are fun and easy to make…my greatest difficulty has been trying to not eat an entire batch of chips as they cool!